Unlike the popular regions of Downtown Kyrenia and the West of Kyrenia, East Kyrenia is largely untouched by Kyrenia hotels, tourists, and modern development. Blessed with a beautiful backdrop of the Kyrenia mountain range which is dominated by Buffavento Castle, amking the perfect place for quiet North Cyprus holidays. The Buffavento Castle is the tallest of the three mountain castles in North Cyprus and provides a faultless panorama of the coast, and on a clear day you can even see down to the Famagusta region and Karpaz peninsula in the south and east respectively. Historical remnants of castle, mosques and tombs aren’t the only attraction in the East of Kyrenia, although they are spectacular, because this area is home to the only 18 hole golf course in all of North Cyprus. The Korineum Golf and Country Club is a wonderful place to relax and enjoy playing in Kyrenia's premier golf course with friends and family before enjoying the facilities of the country club. 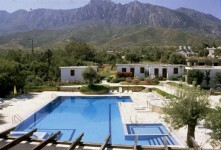 If you’re looking for an escape back into nature, the East of Kyrenia is perfect for you! Some of the long sandy beaches are home to Loggerhead turtles who nest here during the summer and leave their eggs to hatch a few months later around August. Understandably watching the newborn turtles hatch and make their way to the sea is a must see for many people, and the East of Kyrenia is simply the best place to do it. And during the day, the villages and towns are a wonderful place to visit for the beautiful olive trees and small local stalls and shops selling handmade wares. If you’re looking for the perfect place to embrace nature as well as experience the peace and tranquillity that North Cyprus embodies, the East of Kyrenia holidays are for you. 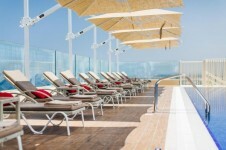 Looking for a holiday to East of Kyrenia ? 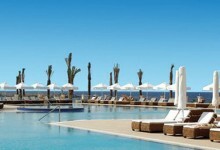 Book cheap holidays to East of Kyrenia, North Cyprus with Direct Traveller.